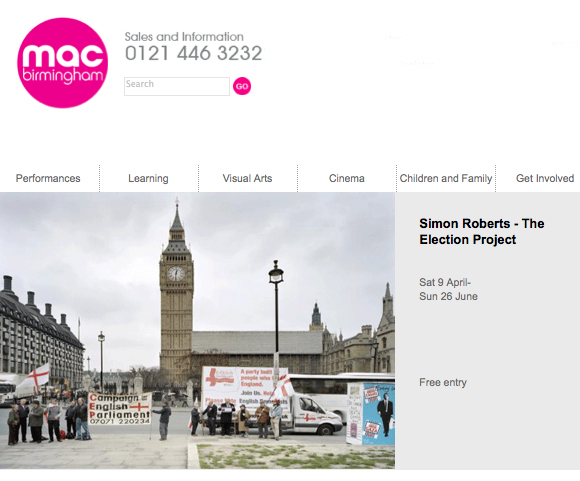 As we approach the anniversary of the 2010 General Election, mac gallery will give audiences the chance to view exclusive photographs taken during the campaign by artist Simon Roberts. From the humdrum realities of day to day canvassing, to iconic moments such as Gordon Brown’s infamous meeting with Gillian Duffy, Roberts’ photographs capture the many dimensions of a General Election. Roberts’ images form a unique social document, which explores the intricacies and eccentricities of Britain’s geographical and political landscape. On show in the Arena Gallery, open daily 9am – 11pm from Saturday 9 April – Sunday 26 June.